I made this tree for my parents when they moved into a small apartment and didn't have room for a real tree for the first time in their lives. It had all of their family members signatures on it so it was really special to them. When our parents moved into a small apartment they didn't have room for a real Christmas tree anymore so I came up with this idea. We were hosting my family at our home that year so I decided to make them a "Handprint" tree. It would get everyone involved and give the younger ones something to make them feel important at this wonderful time of year. As you can see in the picture the handprints are the branches. I don't have a picture of the original so I put together one for a sample for you out of green, peach and brown so your could see the "branches". I know you will finish yours much better than my quick sample. With all of the different size of handprints, it was so cute. We put the smaller ones to the top and the larger ones to the bottom. Ours was much larger with around 20 "branches" and each "branch" was signed. As soon as my 16-year-old niece came I explained to her what I wanted to do, gave her the supplies, and she took over. As people came and got settled in, she or one of the other nieces or nephews she had ask to help her, had each guest put their hand on a sheet of the construction paper and they drew around their hand. That person then signed their handprint. The older kids cut out the handprints and when everyone had a signed handprint we constructed the tree. We presented our parents with their "Handprint Tree" after supper and they were so pleased. Not only did they have a tree that would not take up any space in their small apartment but also they had the signature of every member of their family. It hung on their wall each year for several years. I am going to send this idea to my daughter and grandkids! 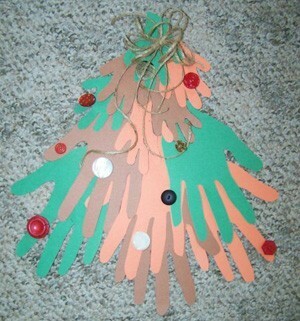 What a cute and inventive way to have a tree with all the hand prints on it. I love it!